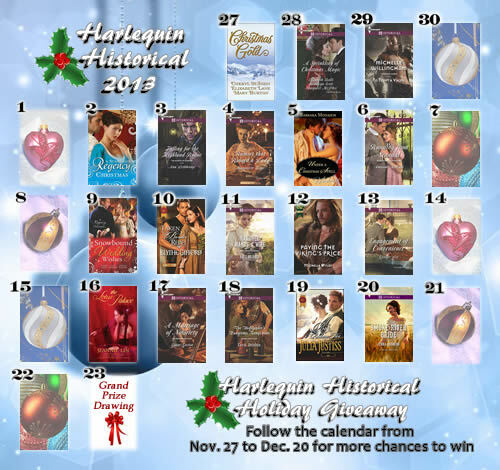 The Harlequin Historical Authors Holiday Giveaway is back. In the spirit of an Advent calendar, the authors are giving away daily prizes and a Grand Prize of a Kindle Fire HDX Wi-Fi (or equivalent tablet depending on your location). Play every day for more chances to win. Each participating author will have an activity planned on their website for their special day. You may be asked to comment on a blog, find an ornament, or visit a Facebook page. For each day you participate, your name will be entered into the Grand Prize drawing. At the end of the month on December 23, one day from the calendar will be randomly selected. One of the entrants from that day will then be randomly selected to win the Kindle. The more days you visit, the better your chances! Happy Holidays and we look forward to seeing you. Click here for official rules and eligibility. Yesterday the cover for Paying the Viking's Price arrived in my inbox. Anyway I think it a great cover. 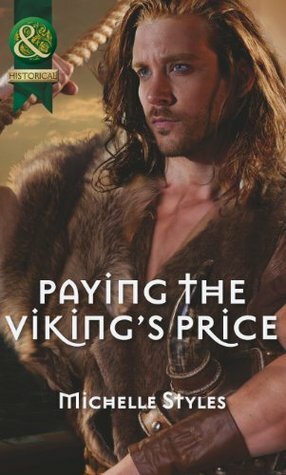 You can read an excerpt of Paying the Viking's Price here. It is published in November 13. There are reasons why I love to go back over my writing book library. The story I am working on at the moment is a non-HQN project and is in the first person because it seems to write like this. But a small problem for me is that I have never written first person before. What I am doing is reworking a story I wrote a few years ago because well there were certain things I loved about it but it wasn't quite right. Anyway, I remembered that Orson Scott Card has a section on First Person narrator in his wonderful book Characters and Viewpoint. In that he discusses the why of choosing narrator, particularly when the story is told in first person. For example with Sherlock Holmes, Watson is by far the best choice as Sherlock is far too knowing. What he does mention as well and it really resonated with me last night is to make sure you understand why the character needs to tell the story. And that the character is the sort of person who would feel comfortable in telling the story. In other words, tale-telling has to be part of the character if you choose that character to be the vehicle or vessel to tell the tale. An emotionally closed character without a compelling reason to put the story down may not be the best choice even if they are the protagonist or driving the story. You also have to know who the narrator is telling the tale to. Is it the tale for general consumption (aka memoirs) , a journal (so ultimately for their later self) or for someone else entirely.If you are going to use first person, you have to know. it affects the choices you make in telling the tale. This is less of a problem with 3rd person limited because it is more like the reader is watching a film. Anyway, I found it interesting and it has given me insight into my narrator. Last night I listened in horror as the events unfolded at the Boston marathon. So senseless. So tragic. My heart goes out to all those who are affected. Back in 1999, I stood on the finish line sidelines with my three children, waiting for my husband to finish. Probably very near to where the explosion happened. Boston is a lovely city full of wonderful people. Everyone was so kind. I can clearly remember someone handing out juice bars and making sure that my lot got some. People were just kind to a woman with three young children, including one in a pushchair. They made space so we could see the racers and cheer them on. I have very good memories of the city and the people. When my lot were young, we went to a lot of races to cheer my husband on. Marathons always have a special atmosphere. People are relaxed and excited. Everyone is working together. And the runners are the focus. It is a shame that the innocence has been lost. The Boston marathon is a great race and I hate that it was targetted in this manner. There is never any justification for this sort of behaviour. Ever. Today (10 April) I am visiting with Angi Morgan at Get Lost in a Story. I reveal the playlist I used for An Ideal Husband? plus have a giveaway for a signed copy. A really lovely piece of news was that Happily Ever After the USA Today column which is devoted to all things in the Romance genre featured An Ideal Husband? in the latest column. I was totally thrilled as it was so unexpected! Writing wise I am busy working on my non HQN project (and enjoying it very much!) as well as waiting for my eidtor to get back me with her thoughts on my latest Viking. 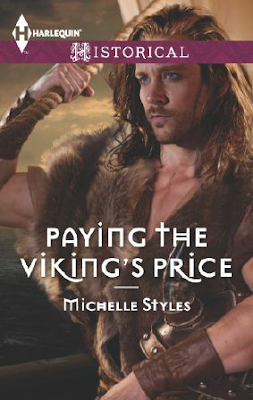 My editor FINALLY let me know what my Nov release will be called Paying the Viking's Price. It really works for the story where a Anglo Saxon lady is forced to become a Viking's concubine as the price for keeping her people safe. Today you can find me doing the Quick Six for Tawny Weber. A signed copy of An Ideal Husband? is up for grabs to one lucky commentator. It is an either or question. The winner will be chosen on Sunday. And I promise to update this blog more. I did however turn in my latest Viking and am now working on my paranormal from ages ago (but it is a total rewrite as I went badly wrong). The great thing about writing is that you can always rewrite. Goodreads Giveaway for An Ideal Husband? It can be hard but I do ship everywhere for contests etc. I will be doing my newsletter later in March but first I need to finish my wip and submit it.It is getting getter, depsite my head hitting the desk moment on Monday when I realised that I had stretched out a plot point for far too long and had thus disapated the tension and the pacing was off. An extended period of ripping and writing is currently happening but the book will be better for it. Giveaway ends April 04, 2013. The Hexham Courant has done a lovely article about me and my study for their My Favourite Room Series. 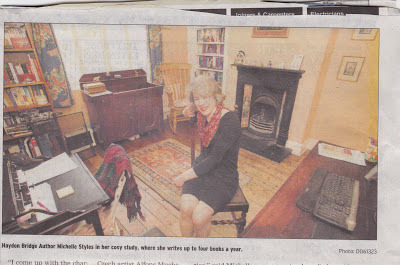 The url isn't up yet but I managed to procure a copy and am posting the photo of me in the study. My husband will say that it is visual proof that my studdy can be tidy!!! First of all, my latest manuscript sold on 18 January. No title or schedule release date and no word if it is going into retail in North America. Persoanlly I think it is excellent with really strong plot hooks, well developed characters and an exciting plot line but I would say that. I am hard at work with the next one and very excited about it. It is another Viking. A berserker this time. My new editor is allowing me to have darker heroes. The No Sugar month was a success. I learnt lots. Going no sugar/sweetners is very hard. There are times when the body demands sugar, particularly in stressful situations. Nutrient rich starchy carbs really do have a part to play. The excessChristmas weight has dropped plus some more. Other than being no sugar, I have not been dieting -- so I have been eating my own homemade bread for instance. I had birthday cake on my 49th. I made the frosting. It was far too sweet. I much prefered the walnut/coffee cake part. I also tried some custard I had made a day earlier. Again far too sweet, even though I had put in less sugar than the recipe called for. Fingers crossed that I am losing my sweet tooth. I have not been really tempted. Going forward, I am doing limited sugar which basically means sugar/sweetners on Special Occassions. I did read Rob Lustig's Fat Chance --the Bitter Truth about Sugar -- it is always good to read a book that confirms one's research into the topic. Basically all successful diets really limited sugar and increase fibre (high in micronutrients). They are also low in trans fats and omega-6 fat. If you do consume fat and carb mixed, you have an equal amount of fibre. The rest is really window dressing. Other good tips for losing weight are: eat protien with your breakfast. Never skip breakfast. get enough sleep. Wait 20 min before having seconds. Exercise. Very basic but practical. The real is to eat real food. Avoid the processed. And listen to your body. The fibre connection is interesting. Nurtient rich strachy carbs all have a lot of fibre. Fibre contributes to making you feel full and getting rid of toxins. It also speeds up transit times. Right I am on 2.1 L5 Day 46. Tracy Anderson takes it to new heights in Year 2. There is the added challenge of the chair. It is used in a number of ways -- a blocker to ensure you are reaching the right angles, a balance bar and a support for planks. Thus far on omni I have managed without having arms on my chair. I simply adjust my hold. I saw no reason to shell out more money for a chair with arms. The important things is that the chair needs to be sturdy enough to climb on and easy enough to move about. You should be able to get under it but in the first level, I found I was getting claustrophobic and so Imagined the chair about me. It worked. Tracy uses ankle and wrist weights -- both lighter (1.5 lbs). I have taken to stopping the dvd and transferring my wrist weights to my ankles. It works. You only want to add the weights AFTER you can do the exercises with perfect form and for the required number of reps. The fact that she is wearing the weights is an invitation, not a commandment for every workout on that level. I did check with the TAM team. It makes sense. I have also learnt that precise form is essential. Not only do you want to hit the angles (the higher the leg, the tighter, the bum) but you also want to keep the tempo. Sometimes going too quickly can make the exercises easier. This is unfortunately true of the planks so I am trying to be mindful and slow down. The positioning of the knee is key in many leg lifts. A slight shift in the foot position during a lunge can make a difference to where you feel it. And arm positioning can mean the difference between balancing or falling. I learnt this the hard way on this level when in the second to the last exercise I didn't have my support arm down at right angles to my body. I keep gently toppling and then I looked and saw. Adjusted and I could do the bloody exercise. My No Sugar January is going well. I do feel a lot less bloated. My mid morning cravings have gone and I am often no hungry for an afternoon snack. I went through a period last year of feeling like I was starving all the time which was when I discovered nutrient rich starchy carbs. I am currently writing a synopsis for my latest Viking partial and preparing to send it to my editor -- whenever she lets me know about the revised one. Fingers crossed. Ever since his brother died, Heathcliff has been allowed free run of the house at night instead of being locked in the kitchen. One consequence is that if I don't get up when my alarm goes, Heathcliff comes over and either meows very loudly or puts his cold nose on the inside of my wrist which shocks me into action. He doesn't sleep on the bed. We moved his basket up and he does sleep there. He also will sleep on my eldest's bed (if my eldest is away) or even my daughter's bed (again she has to be away). But once the alarm goes off, he is there on my side of the bed. He totally ignores my sleeping husband and simply goes for the hand who will feed him. Using this principle, I have been sending the collies upstairs to wake up the children if they are not down at suitable time. They have a habit of ignoring me. I often have to go and open their bedroom doors to allow the collies access... but once they have access, the collies know what to do. Tess is polite and merely noses the sleeping child. Hardy however gets into the swing of the game, leaps on the bed, normally landing on said child's stomach and then proceeds to wash the child's face. This goes on until said child actually moves. Strangely enough, my eldest only had to have it happen once...my youngest though waits for it. Hardy is far more polite with my daughter and only noses her, rather than jumping on her bed. My No Sugar campaign is going well. My writing less well but it is getting done. This VIking should be excellent when done. As part of my New Year resolutions, I am doing a no Sugar Janaury. It should help me detox. Refined sugar is one those things which is bad for you in large quantities. How large depends on your own metabolism and hormones. Anyway after feasting through out Christmas, I have decided to give my digestion a break and take a rest. Funnily enough, it is currently easier than I thought it would be. It feels good not to be eating the sweet stuff or drinking the alcohol. Alcohol has a lot of sugar. I am also avoiding processed food (which normally has sugar added) and not adding any sweetner (including honey). After one day, I can feel the bloating dropping. One of the problems with lymph oedema is that I do swell up if I don't eat properly. I have contined to do my TAM over the Christmas period. Year 2 is challenging but good fun. My writing has been slow because I have been concentrating on my family.